Nerf darts are also drag stabilized, so there must be some sort of ratio that also optimizes accuracy and distance, I would think? Accuracy and distance are two different things, so if there’s a ratio that optimizes both accuracy and distance, that’d be very convenient. But you are right; there probably is a ratio that optimizes accuracy. I’m not sure what this ratio is. Simple theoretical work I’ve done suggests that any dart length that puts the center of gravity ahead of the center of pressure is good, but reality says it’s more complicated than that. 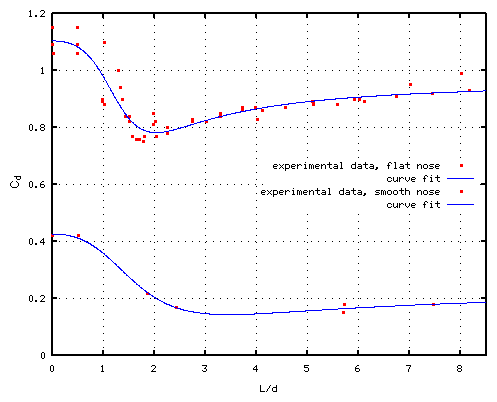 I’ve read a fair amount about flow induced vibrations to help understand this, and unfortunately it does not appear that the experimental data we need to figure out dart stability (i.e., whether or not it’ll fishtail) exists. So I’m doing a physics experiment and using three different darts, they are about 7.5cm (2.9in) what will be the drag coefficient for them? I’ll need more information. The plot needs both length and diameter. Once you know the length-to-diameter ratio (L/d) then you can look it up on the plot. Then the L/d ratio is easy because 7.5 divided by 1 is 7.5. Look at the plot above for the cylinder case and you’ll see the drag coefficient should be about 0.9 if the dart were a perfect cylinder. Nerf darts aren’t, but 0.9 should still be a good estimate.